Implantation of the embryo in the uterus is a critical and complex event and its failure is widely considered an impediment to improved success in assisted reproduction. Depending on whether placentation is invasive or superficial (epitheliochorial), the embryo may interact transiently or undergo a prolonged adhesive interaction with the uterine epithelium. Numerous candidate interactions have been identified, and there is good progress on identifying gene networks required for early placentation. However no molecular mechanisms for the epithelial phase are yet firmly established in any species. It is noteworthy that gene ablation in mice has so far failed to identify obligatory initial molecular events. Implantation of the embryo into the uterine wall is a requirement for developmental progression beyond the blastocyst stage in vivo. Its obvious significance to species survival implies the need for a robust mechanism that can survive suboptimal conditions of e.g. nutrition or infection. Since problems in pregnancy frequently originate in the pre and peri-implantation period, understanding the mechanisms of implantation will facilitate the discovery of therapies applicable at a time when both embryo and endometrium are at their most accessible. The human embryo implants about 7–11 days after the LH peak [1, 2]. Many human conceptuses fail to implant because of genetic or metabolic abnormalities [3, 4], but poor uterine receptivity has been widely proposed as another cause of implantation failure [5–8]. In rat and mouse, the implantation window lasts for only about 24 h at day 4–5 of pregnancy . Unimplanted blastocysts recovered by flushing and transferred to receptive mothers give normal pregnancies, and blastocysts transferred to pre-receptive uteri implant according to the maternal schedule [10, 11], indicating that receptivity is largely maternally controlled. However, the molecular basis of this phenomenon is not understood. In domestic livestock species with non-invasive (epitheliochorial or synepitheliochorial) implantation, a pre-attachment phase of 8–15 days is followed by a more prolonged period of apposition and attachment; as a result, these species offer clear advantages for the elucidation of cell adhesion and intercellular communication mechanisms. Hormonal requirements for implantation have been defined by replacing embryos in ovariectomised mice or rats under various regimes of exogenous steroid. The required sequence is estrogen (E) followed by progesterone (P), and then E plus P. The E/P-primed uterus supports the survival of blastocysts within the lumen for a considerable time, as long as daily P is administered (delayed implantation), and a dose of E during P stimulation is an absolute necessity for implantation to occur. This corresponds to the nidatory E pulse in natural cycles. Experimentally, the size of the E dose affects the duration of the receptive phase . The post-receptive uterus is hostile to unimplanted embryos, which degenerate. While rats and mice are useful model systems, some key features are clearly not relevant to human where, for example, the influence of a post-implantation uterine cavity on unimplanted conceptuses is irrelevant since menstruation is imminent . The human receptive phase probably ends when corpus luteum rescue is no longer feasible. Pre-implantation endocrine patterns during human conception cycles resemble closely those seen in non-conception cycles, though circulating luteal phase E and P levels are rather higher in the former . Endometrial preparation in artificial cycles does not depend on the precise replication of natural cycles , and it remains unclear whether luteal phase E production is required for implantation in women. The high level of E in ovarian hyperstimulation cycles has an adverse effect on mouse endometrial receptivity , but may also affect the embryo directly with inhibition of implantation, as observed in vitro . If mouse embryos are transferred to one oviduct at the pronuclear stage, and simultaneously into the contralateral oviduct at the 8 cell stage, both implant, though in the former case implantation is delayed by at least one day. Developmental synchronisation has occurred by the neural plate stage . This experiment suggests that an embryo-maternal dialogue influences the timing of the receptive phase. The early human maternal-fetal interface is characterised by the blockage (by trophoblast) of maternal spiral arteries and no blood flow through the intervillous space, so the system is very hypoxic. In contrast to the arteries, maternal glands open into the intervillous space, and glycogen and other glandular secretory substances (histiotroph) are taken up by trophoblast . In the mouse, ablation of the hypoxia inducible gene Arnt/HIF1α leads to abnormal placental development and pregnancy failure, suggesting a role for hypoxia-regulated genes. In sheep lacking uterine glands, embryos develop to the hatched blastocyst stage, but do not progress, probably because of a failure of attachment . This suggests that glandular histiotroph may contribute to implantation . Calcitonin is an endometrial gland cell secretory product expressed in response to P  that is important for pregnancy outcome in rats, as indicated by a reduction in implantation rates if maternal expression is blocked using antisense oligonucleotide . Calcitonin acts on the preimplantation embryo by binding a G-protein-coupled receptor, triggering an increase in intracellular calcium, activation of adenyl cyclase and expression of the fibronectin receptor, integrin α5β1 , a part of the activation step (see below). Mouse uterine glands secrete leukaemia inhibitory factor (LIF) which is essential for implantation . It binds to receptors in the luminal epithelium (LE), triggering stat-3 activation only on the day of implantation . Together with embryo-derived signals, LIF, acting via the LE initiates a signalling cascade that leads to stromal decidualisation . However LIF inhibits decidualisation of stromal cells in vitro perhaps suggesting a restraining role away from the implantation site . Various molecular abnormalities are associated with the absence of LIFduring the receptive phase, such as lack of expression of Cox-2 and EGF family cytokines including heparin-binding epidermal growth factor (HB-EGF ) as well as the secreted protein coch-5b2 . The prostaglandins/prostacyclins, products of Cox enzyme activity, have been considered important instruments in initiating decidualisation. Indeed when wild type embryos were transferred to the uteri of Cox-2 null C57Bl/6J/129 mice a decidualisation reaction was not observed and they were reported not to implant [28, 29]. However in another study on these mice it was shown that implantation occurs normally but decidualisation is delayed . Moreover it appears that, in Cox-2 null CD-1 mice, compensatory upregulation of Cox-1 occurs at the implantation site, maintaining prostacyclin levels and allowing at least some implantation reaction although this is delayed . These observations make evident the importance of genetic background . It is clear that the embryo signals its presence to the maternal system but few changes in decidualising stroma have been identified solely in response to the embryo, as distinct from being products of decidual differentiation. Although interferonτ (an important embryonic signal to the mother in ruminants) is not produced by murine blastocysts, an interferon–stimulated gene (Isg15) has recently been shown to be expressed in murine decidua, as in other species, in an embryo-dependent manner . Metabolic changes occur during pre-implantation development, from the relative quiescence of the cleavage stages to the metabolically more active blastocyst with its high rate of glucose uptake . Replacement of blastocysts has been advocated in human assisted reproduction programs, since it allows preimplantation genetic investigation to be carried out after removal of one or two cells at the cleavage stages [34, 3]. A two-stage culture protocol has been adopted with somewhat richer nutrient provision during the morula to blastocyst phase . When culture is carried out continuously in nutrient-poor medium, some embryos develop to blastocysts, but implantation rates are reduced. Human blastocyst morphology varies greatly, but karyotypically abnormal embryos can develop into apparently normal blastocysts. Just as with the karyotype, the metabolic characteristics of morphologically normal blastocysts vary greatly . Thus the ability of an embryo to develop to this stage does not guarantee successful pregnancy. However, morphology of karyotypically normal blastocysts is likely to be a good indicator of pregnancy outcome . Blastocyst, as opposed to early cleavage, transfer allows synchrony between embryo and tract environment, and allows selection of competent embryos to facilitate single embryo transfer. 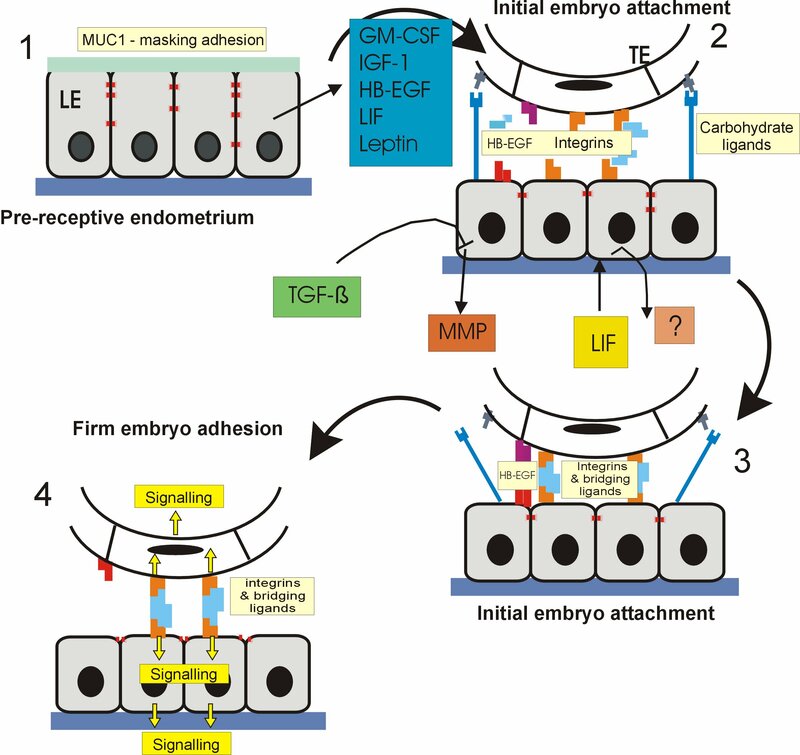 Growth factors secreted in response to E and P from both oviductal and endometrial epithelium contribute to the milieu of the developing embryo. Numerous factors, including insulin, LIF, leptin, heparin-binding epidermal growth factor (HB-EGF) granulocyte-macrophage colony stimulating factor (GM-CSF) and insulin like growth factor 1 (IGF-1) have been shown to increase either the rate of embryo development to blastocyst stage or blastocyst cell number in culture (Figure; reviewed in: [38, 39]. Studies in genetically modified mice have also demonstrated a clear role for pre-implantation signalling between mother and embryo. GM-CSF is produced by the uterine epithelium and stimulated by E  while the embryo expresses a GM-CSF receptor . Mice genetically altered to lack GM-CSF produce blastocysts with fewer cells in the ICM, and these give rise to small pups. The defect can be rescued by culturing null preimplantation embryos in medium supplemented with GM-CSF before replacement . In cow, GM-CSF localises to the apical LE surface both before and after embryo attachment, and is upregulated by interferon-τ produced by the embryo . Human embryos express GM-CSF receptors [43, 44] and so can respond to this ligand. Before an embryo can attach to the uterine surface, it must hatch from the zona pellucida. Two serine proteases, ISP1 and ISP2 (implantation serine proteases 1 and 2), have been implicated in hatching. ISP1 is produced by the embryo, while ISP2 is produced by uterine glands. These enzymes may also be required for local proteolysis of maternal tissue as part of the process of invasion . In addition to metabolic activation and hatching, the blastocyst must be activated to attach to maternal luminal epithelium (LE), at least in the mouse model of delayed implantation. In the presence of P, dormant blastocysts are closely apposed to the uterine epithelium but do not attach. E treatment produces a receptive state in the uterus mediated by interaction of estradiol-17β with its nuclear receptor. In contrast, the embryo is activated (as evidenced by induced EGF binding) by a catecholestrogen, 4-hydroxyestradiol-17β, produced locally in the endometrium as a metabolite of estradiol [46–48]. Activation of blastocysts is unaffected by blocking nuclear ER signalling, but prevented by inhibition of prostaglandin (PG) synthesis, adenyl cyclase or protein kinase A (PKA). This suggests a pathway in which PG stimulates cAMP synthesis to mediate activation though PKA. One important manifestation of activation is the early translocation of integrins α5β1 and α4β1 to the apical surface of abembryonic TE in mice [49, 21, 50]. Integrin α5β1-fibronectin engagement induces calmodulin-mediated calcium transients in the blastocyst, suggesting outside-in signalling . Moreover, fibronectin induces trafficking of αIIbβ3 and appears to be involved in the strengthening of interaction between trophoblast and uterine fibronectin as trophoblast invasion commences . After attachment to the epithelial surface, embryos of interstitially implanting species invade the underlying stroma. Embryonic genes are emerging which have essential functions in the early post-epithelial phases of implantation; their ablation gives a phenotype that resembles implantation failure. Mouse embryos genetically modified to lack integrin β1 fail to complete implantation, probably because of an inability to bind the maternal subepithelial extracellular matrix . Embryos lacking the Ron/STK receptor tyrosine kinase, a member of the c-met family which is expressed in trophoblast, fail at similarly early stages. Its ligand HGFL is contemporaneously expressed in the uterus. However, HGFL-null animals implant normally, suggesting the existence of another ligand . Others have reviewed genes required for early development of the embryo/placenta [55, 56]. The classical model of E acting on endometrial cells to stimulate P receptor expression, with P then inducing differentiation and preparation for implantation, is an oversimplification, because receptor expression varies in a complex fashion in different cell types and tissue compartments in the uterus . The basal endometrium, from which post-menstrual regeneration occurs in human, differs from the superficial or functional layer . These differences arise at least in part because of site-specific paracrine interactions between the epithelium and stroma in regulating endometrial function, as established elegantly in studies of mice lacking E receptors . Epithelial proliferation in response to E does not occur in receptor (ERα)-negative stroma recombined with wild type epithelium, but occurs normally if the receptor is present in the stroma and not the epithelium. However, the control of expression of epithelial secretory proteins such as mouse lactoferrin relies on the presence of receptor in both stromal and epithelial compartments. The same principles apply to human endometrium; for example, in secretory phase, P stimulates PR-bearing stromal cells to produce transforming growth factor β (TGFβ), and this in turn suppresses production of matrix metalloproteinase 7 (MMP7) by the epithelium in a P-independent step. At the end of the cycle, P levels fall and MMP7 contributes to extracellular matrix (ECM) remodelling during menstruation [60–62]. Although ERα is thought to be the main receptor mediating E effects in the uterus, both mouse and human endometrium express lower levels of ERβ. Ablation of ERβ in mice compromises reproductive function  and current evidence suggests it may act to modulate ERα. Similarly, P receptor splice variants A and B function as distinct transcription factors . The localisation of ERβ (but not PR) to uterine NK cells  which colonise the endometrium in late secretory phase, serves to emphasise that careful delineation of the cell types in which receptors are expressed is just as important as monitoring their cycle dependency. Endocrine mediators other than E and P also play a role. Endometrial cells express the androgen receptor AR ), the luteinising hormone receptor LHR, the gonadotrophin-releasing hormone receptor , the prolactin receptor , the leptin receptor Ob-R  and the relaxin receptors LGR 7 and 8 . AR can be expressed in stromal as well as epithelial cells but its functions in endometrial physiology have not been defined. Human chorionic gonadotrophin (hCG) is a ligand for LHR, raising the possibility of a paracrine interaction with the embryo. Mice genetically altered to lack LHR develop a very small uterus . After steroid replacement, the uterus returns to a normal size and histological features are fairly normal, though fewer glands are present. Embryos transferred into these mice however produce no pregnancies, and at present the explanation for this infertility is not clear. There is evidence that hCG may advance endometrial differentation  and act as an autocrine regulator of trophoblast . Parathyroid-related hormone produced by endometrium induces primary and secondary mouse trophoblast differentation to giant cells in vitro  El-Hashash and Kimber unpublished. Prolactin, produced by human stromal cells undergoing decidualisation, activates receptors on uterine large granulated lymphocytes  potentially influencing their role in post-implantation uterine function. Recently, the search for elusive markers of endometrial receptivity has included differential display, subtractive hybridisation and differential microarray screening to compare the endometrial transcriptome in receptive and non-receptive states. It is conceptually useful in these studies to distinguish genes (such as tyrosine kinase family receptors or transcription factors) that may directly or indirectly influence the downstream expression of a set of target genes from those (such as integrins) directly involved in cell interactions. Since implantation seems to occur in a range of endometrial 'settings' (i.e. variations in gene expression), it will be necessary to ask whether expression of 'master genes' with the ability to change these settings is altered in infertile women. Several studies [76–79] have compared human mid secretory phase endometrium with non-receptive stages (either early secretory or proliferative). In one study, patient-to-patient variation was eliminated by sampling tissue from the same individual at two different times of the same cycle . Consistent patterns of 'receptive state' gene expression have not yet emerged. Some known genes – osteopontin is a notable example  – exhibit alterations consistent with previous data (see below). New genes will require functional study, for example IGFBP-rP1/mac 25 . Certain genes are conspicuous by their absence (indicating lack of detected up or down regulation): notably the transcription factor HoxA10 and the growth factor LIF, both essential for implantation in mouse as revealed by gene ablation, and integrin β3, a subunit of the epithelial and vascular receptor αvβ3 which is regulated by Hoxa10  and a candidate for mediating embryo attachment to the uterine epithelium (see below). Animal models can offer better-controlled approaches. Reese and colleagues  identified mouse genes expression of which is altered in both implantation vs inter-implantation site and delayed implantation uterus (P only) vs tissue that had been E-treated to terminate the delay. Distinct sets of genes are upregulated or repressed in inter-site tissue vs the implantation site, with numerous functional categories represented. Nearly half the genes repressed by E or at implantation sites have immune–related functions. Connexins 26 and 43 and amphiregulin are notably elevated in implantation-receptive RNA isolates, as is nexin-1, a serine protease inhibitor expressed in uterine stromal cells . Decysin, a member of the ADAM family that is present in the uterine stroma, is down-regulated at the implantation site and shows altered expression in the prolactin receptor-null mouse, which exhibits implantation failure that is partially overcome by exogenous P treatment . In a study comparing luminal epithelial genes from implantation site and interimplantation site there was notable upregulation of genes involved with the extracellular matrix and its remodeling or associated with calcium for function at the implantation site . Differential display of cDNA species present in implantation and inter-implantation sites on day 4.5 of pregnancy in the mouse has identified differential expression of several proteins. This includes an increase in transcripts encoding the calcium binding protein calbindin-d9k (CABP-d9k) in the luminal epithelium at the interimplantation site [87, 88]. Downregulation of CABP-d9k at the implantation site  or after blastocyst transfer  suggests precise spatial and temporal regulation of calcium-mediated signalling, or calcium availability, may be critical during implantation as also indicated by the importance of calcitonin (see above). Subtractive hybridisation of endometrial libraries has identified other interesting leads in rhesus monkey  and rabbit . Mouse maternal implantation genes regulated by P have been identified by transcriptomic analysis comparing receptive phase uterus with or without an implantation-blocking dose of the anti-progestin RU486. P-dependence was subsequently confirmed by re-assay in the P receptor knock-out (PRKO) mouse . Alterations are observed in several genes of known importance including Hoxa11 [94, 95], amphiregulin [83, 96], laminin α2  and spermidine synthase , validating the approach. In vivo uterine administration of antisense oligonucleotide to Irg1, a gene identified in the implantation phase LE, blocked implantation . Other novel genes are now candidates for functional analysis. In all species there is an initial interaction, no matter how short-lived, between the outer TE cell surface and the apical LE. It is likely that a cascade of adhesion events is initiated [98–100] (see Fig). In turn this leads to signalling events, targets for which are located in both epithelial and subjacent stromal cells. Other than the most immediate responses at implantation, the stromal changes lie outside the scope of this review. A change in epithelial cell organisation at the time of implantation seems to occur generally across the range of mammals, irrespective of differences in control mechanisms and subsequent trophoblast behaviour . In mice, attachment to the maternal epithelial surface is followed by apoptosis of the epithelial cells, allowing trophoblast direct access to the underlying basement membrane and stroma [102, 103]. In human, it is thought that intrusive penetration of the epithelium is followed by its displacement, but there is also evidence that epithelial apoptosis may occur . Early postovulatory and receptive LE have very different phenotypes. Gap junction distribution and complexity changes in the LE lateral membrane in several species at receptivity. Connexins 26 and 43 are regulated in LE and stroma during the human menstrual cycle . Connexin 26 is expressed in the rodent implantation chamber epithelium, and CX26 and 43 in stroma, and these are tightly regulated by ovarian steroids including progesterone-mediated suppression [106, 107]. Alterations in LE cell-cell interactions are also indicated by changes in the apico-lateral distribution of cell surface molecules, for instance integrin α6 distribution changes from basal to both lateral and basal during the secretory phase . In mouse, E-induced E-cadherin degradation leads to reduced LE adhesion on d4.5 of pregnancy . Lateral cadherins have also been reported to relocate to the apical LE surface at the time of implantation in rat . In women, changes in E-cadherin mRNA probably reflect E-dependent down regulation . Desmosomal proteins are downregulated and redistributed along the lateral cell surfaces in murine LE  and the density of desmosomes similarly decreases in human at the expected time of implantation . LE cell polarity becomes less marked with appearance of latero-basal markers in the apical membrane . The cells are flatter and microvilli are replaced by bulbous protrusions (uterodomes) in many species [115, 116]. In women, uterodomes appear in LE cells about 5–6 days after ovulation [117–119] correlating with the expected receptive phase. Studies using repeated biopsy demonstrated that uterodomes have a lifetime of less than 48 h. Three human blastocysts co-cultured with endometrial epithelial cells were reported to attach where clusters of cells bearing uterodomes were present in the cell layer . In common with other epithelial surfaces, the uterine LE contains an apical glycocalyx which allows the diffusion of small molecules but inhibits cell adhesion , and protects the upper tract from infectious agents. The cell surface mucin MUC1 is a component [120–123]). In mice and rats, Muc1 is downregulated precisely at the time of implantation under the control of maternal steroids . Consistent with this, it emerges as a highly upregulated (6-fold) gene at day 4 in pregnant mice that have been treated at day 3 with a single dose of RU486 . There is evidence that another surface mucin, Muc4, is also downregulated in rats . Loss of Muc1 also occurs in pig and sheep [126, 127], while in contrast, humans express high levels throughout the receptive phase, though the pattern of its glycosylation changes [120, 123]. Indeed, mucin-associated oligosaccharides are useful markers of endometrial differentiation  and pathology [128, 129]. Experimental studies of human implantation in which embryos hatch and attach to endometrial epithelial cells in monolayer culture have shown that Muc1 disappears from a small area of cells that surround the attached embryo [130, 131]. The mechanism of removal is not established, though it has been shown that a proteolytic cleavage event catalysed by ADAM17/TACE can mediate release from the surface of cultured cells, and that ADAM17 is expressed in the LE . Local remodelling of the glycocalyx implies an earlier interaction (apposition) that positions the hatched blastocyst at an area of LE where implantation will subsequently take place. Carbohydrate-lectin binding has been suggested to mediate initial weak attachment in a parallel with the leukocyte-endothelial interaction that occurs at inflammatory sites [115, 133, 134]. The epithelial H-type-1 antigen Fucα1-2Galβ1-3GlcNAcβ1-4 is expressed in LE in several species [133, 134]. Its involvement in implantation has been suggested in the mouse, where attachment to endometrial epithelial cells is inhibited by free oligosaccharide in vitro (reviewed in . However, other evidence suggests that H-type-1 interaction is not essential to implantation or can be compensated in its absence: implantation is normal in mice carrying a deletion of Fut2, the fucosyltransferase required for H-type1 biosynthesis . Furthermore uterine injection of antibody to H-type-1 fails to block implantation . From antibody inhibition in vivo, the possible involvement of the Le-y carbohydrate antigen (Fucα1-2Galβ1-4[Fucα1-3]GlcNAcβ1-) was suggested [136, 137]. This is present on the blastocyst surface in mouse and on LE in mouse and human [138, 139]. Since Le-y glycolipid has been demonstrated to bind H-type-1 and-2 chain glycolipids, Le-y on the blastocyst could interact with H-type-1 on apical LE . However, the Fut2 enzyme is again required to produce ligand. The selectin ligand sialyl Le-x is present on human LE where it is carried by MUC-1 . It increases in the mouse LE during the receptive period . There is uncertainty as to the expression of selectins on human and mouse preimplantation embryos [142–144]. In sheep, the mucin GlyCAM-1, a ligand for L-selectin in lymph node endothelium, is expressed both by LE and trophectoderm during the initial interaction period . In homozygotic mutant mice null for each of the three selectins, and in mice lacking two or all three selectins, embryonic development, implantation and pregnancy appear normal [146–148]. Heparan sulphate has been implicated in several implantation models. The blastocyst expresses syndecan-1, a transmembrane heparan sulphate proteoglycan (HSPG), but little can be detected at the outer surface of TE  and its absence after gene deletion does not appear to influence fertility . Perlecan, the major basement membrane HSPG, surrounds the blastocyst after hatching and expression of the mRNA and protein correlates with acquisition of attachment competence [151, 152]. Again, perlecan-null embryos show no implantation phenotype, being indistinguishable from wild type embryos until d9.5 . A truncated form of heparin-binding EGF-like growth factor (HB-EGF) is induced in the LE by the embryo and could also interact with HSPG . HB-EGF appears in epithelial cells immediately adjacent to the implanting embryo just 6–7 hours before the embryo attaches. In delayed implantation, HB-EGF appears only after the nidatory E stimulus is given. HB-EGF has been suggested to play two different roles: in addition to accelerating embryo development, it has a membrane-bound variant that can mediate intercellular attachment by binding to erb-B4 as well as to heparan sulphate proteoglycan on the mouse blastocyst [155, 156]. HB-EGF-null and erb-B4-null mice develop heart problems [157, 158]. Erb B4 nulls die early in gestation while the majority of HB-EGF nulls die before weaning. However, surviving HB-EGF-/- adult females are fertile, and fertile erb-B4 nulls can be produced after cardiomyocyte-specific rescue of the heart defect. Trophinin is a membrane glycoprotein that forms complexes with the proteins bystin and tastin, and was identified as a candidate mediator of embryonic attachment by the demonstration of its involvement in adhesion of human trophoblastic and endometrial cell lines [159, 160]. Early secretory phase human endometrial epithelium expresses trophinin and tastin at the apical surface, and at the macaque implantation site, trophinin expression is observed at the apposed apical surfaces of TE and LE. However, murine implanting blastocysts do not show detectable levels of trophinin protein, and although there is a partial embryonic lethality associated with ablation of the gene, this appears to be a post-implantation phenomenon . Basigin (EMMPRIN, CD147) is an immunoglobulin superfamily member with putative roles in cell interaction, MMP activation and orientation of ion transporters in the plasma membrane. It is expressed in the LE  and also in decidual cells . Igakura et al  showed that transfer of wild type blastocysts into basigin-null females resulted in a very low rate of implantation. Menstrual cycle-dependent molecular variants have been observed in human endometrium . Integrin αvβ3 has been suggested to be important in embryo attachment in human, mouse, rabbit and farm animals [5, 18]. The β3 subunit exhibits regulated expression with the heterodimer αvβ3 present in human epithelium only from about day 19. αvβ3 is also present on the external surface of the expanded blastocyst [142, 166]. Its ligands include fibronectin, vitronectin, tenascin, osteopontin, thrombospondin and possibly laminin (see [98, 134]). Neutralising antibodies to either αv or β3 integrin injected into mouse uterus, although producing some apparent effect, failed to induce a statistically significant reduction in implantation sites. However echistatin, which inactivates αvβ3 integrin as well as αiibβ3 and α5β1 , and an RGD-containing peptide, did produce a significant reduction in implantation sites . This may suggest that other integrins which bind to the RGD sites in ligands play a redundant or overlapping role in implantation. Osteopontin is a secretory product of endometrial glands, is associated with the apical surface of luminal epithelial cells, and is directly regulated by P, with maximal abundance in secretory phase [80, 169]. Osteopontin can bind CD44 (which is present on LE  as well as several integrins (αvβ5, αvβ1, α4β1, α5β1 and α8β1). Mice with ablated CD44, which is also a receptor for hyaluronan, do not show obviously impaired fertility . Osteopontin is strongly detected at the apical surface of human endometrial secretory phase glands . It could act as a bridging ligand for TE-LE interactions, but osteopontin-null and osteopontin/vitronectin double knockout mice are fertile . The largest subfamily of integrins shares the β1 subunit. This has been localised, along with α1, α2, α3, α4, α5, α6 and α9 to the lateral and basal surfaces, but not the apical surface, of endometrial epithelial cells (reviewed in [99, 134]). Pregnancy fails in mice lacking integrin β1 at a stage that closely follows epithelial attachment, perhaps reflecting a defect in interaction with the stromal ECM . Expression of integrin α4β1 is highest in human GE between mid proliferative and mid secretory phases. In mouse, in addition to its presence on the surface of activated blastocysts, α4β1 is expressed on the basal LE surface and stromal cells in response to E. Intrauterine injection of monoclonal antibody to α4 reduced implantation rates substantially though it is not clear what interaction was targeted . Since implantation is unique to mammals we cannot extrapolate from other common model organisms in the search for possible targets and mechanisms. Nonetheless our understanding of the process of implantation has grown slowly in the last decade. Some of the interactions that have been recognised as important are shown schematically in the Figure. Current in vitro models reproduce only small stages in the implantation process. Knockout strategies have revealed the essential role of certain soluble mediators (e.g. LIF) and the contribution to reproductive efficiency made by others (e.g. GM-CSF), but it is notable that the crucial structural or attachment molecules have not been identified. The importance of implantation to the survival of mammals means that there may exist multiple parallel mechanisms. Thus either compensatory effects may be invoked or impairment of reproductive efficiency (rather than system failure) following gene ablation. Microarray technology has begun to be used in the search for key implantation mechanisms, but differential screening approaches will identify only transcriptionally-regulated products, with post-transcriptionally- and post-translationally-controlled components likely to remain undiscovered through current research strategies. Proteomics may offer a useful complement to existing approaches. Diagrammatic representation of the series of interactions between the trophectoderm/trophoblast (TE) and luminal epithelium (LE) and subjacent stroma. Potential roles of cell adhesion molecules at each stage are indicated. 1) Pre-receptive polarised endometrial epithelium with desmosomes distributed along lateral LE cell surfaces and non-adhesive apical cell surface; 2) Receptive endometrium and initial embryo attachment: reorganisation of lateral LE adhesion complexes accompanies apical carbohydrate ligand engagement to tether blastocyst; integrins and cell–bound HB-EGF now become available for TE-binding; 3) Stabilisation of initial attachment by αv or other integrin-mediated adhesion involving bridging ligands shown; other components are also probably functional; 4) Potential signalling through cell adhesion ligand-receptor interaction including calmodulin and calcium.